And those 9th Circuit appeals court judges, they’re no pushovers either. They know an abuse of power when they see one, as they ruled 3-0 to uphold the temporary restraining order by a Seattle federal judge that halted Trump’s travel ban on people from seven majority Muslim nations. But later, Trump (presumably after he recovered from his own personal power failure) made the decision not to take the case to the U.S. Supreme Court. When a business person used to seeing himself as omnipotent becomes more of a public servant than CEO, the on-the-job-training period can be painful. But Trump’s lesson on the federal judiciary was also a reminder for all of us. Power is not absolute in a government of checks and balances. Certainly, the lesson was not lost on Dr. Allan Bergano. A dentist from Virginia Beach, Virginia, Bergano is a friend of mine through the Filipino American National Historical Society (FANHS). Along with his wife, Edwina, he is cheering loudly after they visited federal court last week. LISTEN to my podcast interview with Dr. Allan Bergano, who sued to defend his rights. In court, the Berganos got the Trump lesson, but from the perspective of the little guy. Bergano learned the Isley Brothers were right. You can fight the power. And when you’re right, the federal judiciary will back you up. Such was the case for Bergano after an ordeal that began in July 2014 when the building he leased for his longtime dental practice was affected by a road widening in that city. Virginia Beach officials told him he could leave within a year and settle for $75,000. Or he could try to get what other dentists got for relocation benefits–anywhere from $280,000 to $550,000. And then the city, facing a budget crunch, changed its mind and told Bergano he didn’t have to leave after all. By then, the city had changed the nature of the rest of his office complex, moving out older business tenants and putting in social service offices whose clientele created a different atmosphere for Bergano’s family dental practice. And besides, he had put things in motion for the new location. He had spent time and money. He couldn’t stay put. Bergano challenged the city’s decision, but the city told him there was no appeal. “They were saying I wasn’t displaced,” Bergano told me. On top of it all, Bergano and his wife, Edwina, found themselves “homeless” after a fire burned down their condo. Bergano decided to fight city hall and got a lawyer. But fueling his ire was his sense of history of how Filipinos on the west coast faced discrimination in the 1920s and ’30s. Like me, Bergano is the son of an immigrant who came to the U.S. during that time and suffered the indignities of voicelessness. Bergano recalled how his father fought hard to get a college education in America, but despite his education found himself taking houseboy jobs in the Seattle area. That lesson of humility was not lost on Bergano, who also paid for ten years of college and dental school education being an Alaskero, one of the Filipinos who worked up in the canneries by Wards Cove. 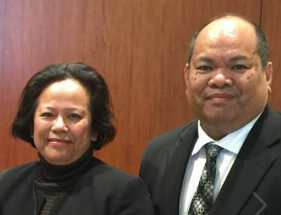 It helped Bergano to become the first Filipino American to graduate from the University of Washington School of Dentistry. It was that sense of history, Bergano told me, that provided him the “spiritual momentum” to not give up in his fight with Virginia Beach. Last Thursday, a federal judge recognized the wrong Bergano had experienced in the eminent domain case. In federal district court in Norfolk, Judge Henry Morgan, Jr. ruled that Virginia Beach was in violation of Bergano’s constitutional rights to due process and equal protection under the law, as well as Virginia’s relocation statutes. Bergano will seek damages this week and hopes to recover his relocation costs, as well as a written apology. He’s elated at the outcome, but admitted to me in our podcast, Emil Guillermo’s Amok Takeout, he was scared before testifying last week in federal court.